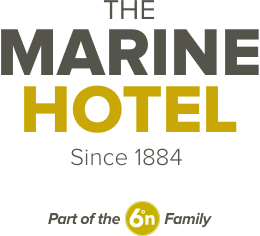 The Marine Hotel takes a holistic approach to your pleasure. We believe that all your tastes should be catered for and so we do not just focus on food and wine but extend our expertise to providing the finest quality whiskies and fine beers from our own brewery and many others. We have put our skills with regard to brewing and tasting into play providing you with 165 bottle-conditioned Belgian beers. We also serve six real ales mainly from Scottish Micros, twelve craft beer taps. We were awarded the best Real Ale Bar Scotland in 2008 and in Aberdeenshire from 2008 to the present day. Our knowledge of Belgian beers is second to none and we can treat you to an experience you won’t forget. Our bar is a fine place to relax and take in those alcoholic pleasures whilst chatting to the locals or just enjoying the view. The adjacent lounge offers a more relaxed family atmosphere with open fire where meals are served daily. Children are welcome.